I have a new to me H&G 2 cav mold, bought unseen, that will need some attention before I can cast with it. Hoping for some help. My search efforts have yielded some data, but want to see if this all makes sense to you. 1. Handles! Yep, now I know! Didn't think about handle compatibility when I made the purchase. Lesson learned! I've read that Ballisti-cast made them, but they don't seem to be in business. I didn't realize that handles would be a challenge. I have a few RCBS and NOE handles onhand. It seems like if I remove about 5/100ths from the thickness of RCBS handles, they would work. The holes are the correct size. See any issues with my logic? 2. Rust! Block exteriors are not too bad. Rust is mostly concentrated in the cavities and sprue plate. I'm thinking about using Evaporust. This would be the first for me on a mold, but it seems very gentle on other things I've used. What do you think? Soft brush and dawn soap have been recommended too, but hoping to not make a big project out of it. 3. One of the set screws doesn't quite reach the sprue pivot screw or the sprue plate stop screw (tried both sides). So it is ineffective. It looks like a prior owner had similar issues since heavy wrenching with a screw driver is evident. Maybe I could drop a piece of lead shot in front of it? Any other ideas? I'm really not looking for a project, so I'm leaning toward just letting this this go for sale. Your input will help me to decide! Thanks! Last edited by Taterhead; 06-24-2018 at 12:44 AM. That's a lot rust in the cavities. Evaparust will clean it up, but you might need to polish them after you cast some bullets. Use some fine polishing compound. You also have lead on the faces that should be removed. Just replace the screws with longer ones. All my H&G's came with long screws. You could keep it for a conversation piece too. with a knife or a toothbrush and some solvent. it might seem line a bunch of work but it shouldn't take that long. You could file down a set of handles to make it work. I have that mold in 4 cavity and shoots good in light .38 loads. Thank you guys for the feedback. I'm going to pass this old mold to someone who would treat her properly and get her up and running. Not up for a project. I would first give it a soak in Kroil Oil as it will get under the rust, so you can see what the damage is. A #2 pencil eraser can also work fairly well to polish and rubbing the cavities with the pencil lead may be enough to even out the cavities somewhat so it can be used. 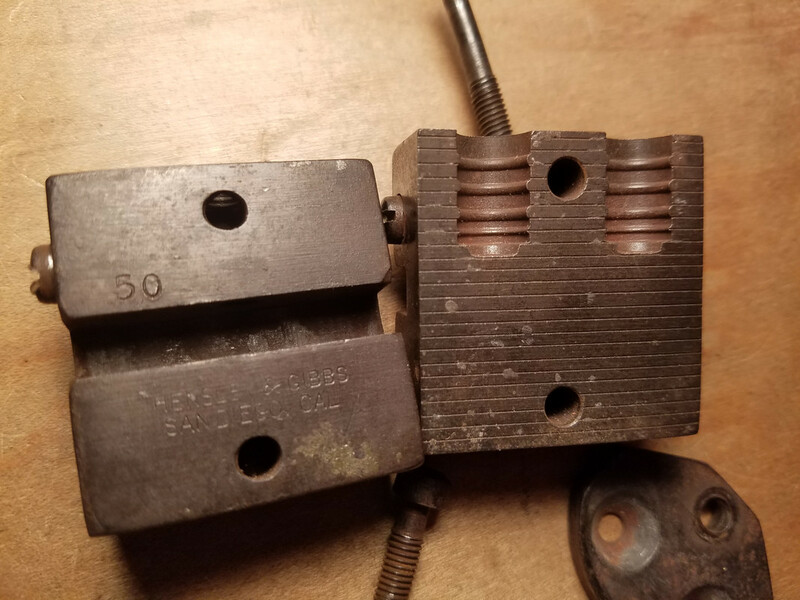 The #50 and especially a two cavity is probably the least sought after H&G mold since 38 wad-cutters are just not that popular anymore, so unless this mold is really something you want I wouldn't put a lot of time and money into. I really hate these sellers, especially on Evil Bay that separate the mold handles on the H&G molds so they can make a couple of extra bucks. The mold handles were included with the H&G molds because they were made to fit the mold they were attached to. Just buying H&G handles doesen't mean they will operate the mold properly without some tweaking. The screws for these molds are also a problem and the lengths tend to vary somewhat. I assume because there changes and custom work preformed over the years. I have several H&G molds and ended up making my own screws by altering available stainless screws. But I think H&G molds are terrific and well worth my effort. The seller, in this instance has been very stand up. I want to make that clear. The tip about Kroil and a pencil eraser are new to me. Thanks for that. I'm the one that sold him the mold. It is how I received it, No Handles. I did not pull them aside to try and make more money on him. I'm trying to clear out stuff I don't need and not mess people around. I offered pics to anyone who wanted them, I offered to take it back as soon as Taterhead messaged me. He declined and I also offered to send H&G screws. When I looked at this mold I'm certain that the sprue plate was tight because I checked it. 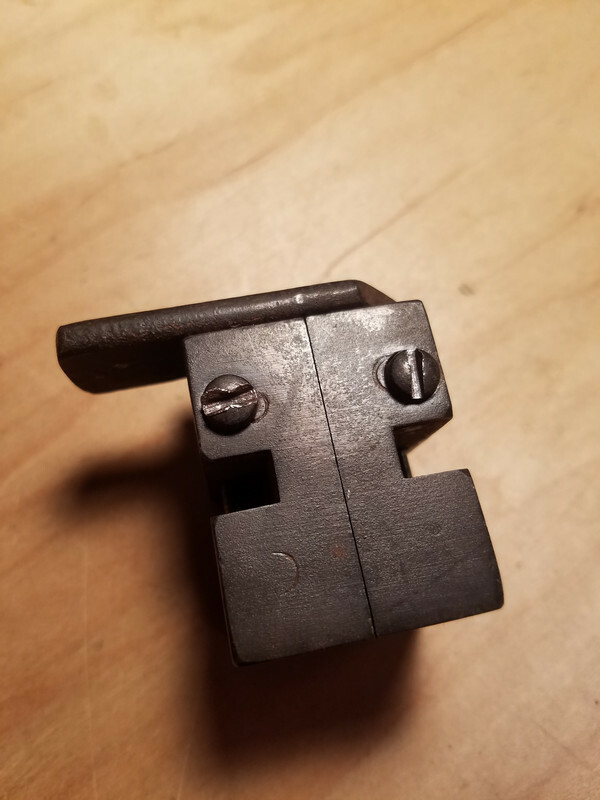 I believe the screw is getting hung up some how because it is recessed enough the screw head can sit almost flush to the body. The cavities did not appear pitted and still don't. It honestly looked more like build up to me. Again I will take it back shipping both ways on me, send screws, or send pics of some other molds I have that I can swap you out of. Thanks and have a great day. Taterhead has been great to deal with as well. Well shoot, WJP, I was hoping to keep the focus on the mold itself, instead of getting into the details of our transaction. But seller intent was called into question so I understand your need to set the record straight since you have other transactions under way. For anyone tuning in, the seller has been absolutely 100% awesome to deal with, and is evidenced by the positive feedback that I placed in the Straight Shooters thread. I don't feel slighted in the least bit, so please let's not make this about what the seller did or did not do. WJP is good-to-go! This is about naivete on my part, not understanding the handle situation primarily. To get this thing up and running, I have a bit of work to do and I'm not in the mood. Look for this mold to be available FTAGH in the next day or two over on S&S. Thanks to WJP, I learned how to properly package a mold for shipping. Learning about H&G molds (and what to think about when buying used) has been worth every penny of the purchase price, so I'm fine. No regrets. Thank you all for your input, and sorry WJP that you were pulled in like this. Absolutely not the intent. WJP, sorry if you got tarred with the same brush and I understand now that you were just passing on what you received. But I have a lot of respect for the men who made these molds and it really galls me when I see their work being disrespected. Just a couple of weeks ago it was obvious a seller on Evil Bay was separating the handles, which is more than a disservice to those that unknowingly buy the H&G Molds. OK, Lee small block handles will work. Last edited by skeettx; 03-16-2018 at 06:26 PM. I was microscopically close to offering it "free to a good home", but suddenly the old mold is starting to grow on me. Well, I looked at this a little closer. The retention screws have just enough galling around the head so that they don't want to counter sink into the mold. One is much worse than the other. One will counter sink with a little fiddling. The other won't go at all. Too fat for the recess in the mold block. A little honing should remove just enough material so that the screws can go deep enough to reach the sprue pivot and stop screws. And the parts are now bathing in Evaporust. Ok. I guess the project that I didn't want to undertake is suddenly underway. If I get happy with the mold, then I have a set of RCBS handles that will have a date with a grinder. Anyone know about how old this one is based on the way it was stamped? Last edited by Taterhead; 03-18-2018 at 01:04 AM. "Anyone know about how old this one is based on the way it was stamped?" That's awesome! Thank you very much. Glad you decided to keep it for now. I honestly think it will clean up to be very nice. Desirable is is up to the end user. I prefer the WC and SWC design. I kept a #50 in much worse shape for myself but a 6 cavity. I'll post some pics before after and cast when I finish cleaning it up. Sometimes things look or appear worse then they actually are with out all the info. No disrespect taken from anyone. I'm here because I enjoy casting even though I once said I would never cast a thing. ETA: A few somewhat before pics. These were after soaking for about 30 mins. Last edited by WJP; 03-18-2018 at 12:22 AM. I’m also glad you decided to keep it. I’m betting that it cleans up good enough to use. A sliver of wood will get the lead off of the faces and careful use of a scribe will easily clean up the vent lines. Evaporust is good stuff! A good scrubbing with a tooth brush and some Kroil should clean the cavities up. You’ll enjoy casting with it! Last edited by lightman; 04-15-2018 at 05:58 AM. A guy at a gun show practically paid me to take this lump of rust . He even threw in the half lb of lead stuck to it for nothing . A 3 hour bath in Evaporust and little steel wool and some fussing with the cavities getting them pretty again . Added some cold blue for aesthetics . It cleaned up nice . I still need to get some grips squared away properly . It casts like a champ but cutting 8 sprues at a time is a bear . I make a copper disc out of romex wire for the set screws. The ground from a piece of #12 about .1" long and flattened with a punch is about right. You may need to trim the corners to get it to fit. Tightening the setscrew will give you a custom fit. After it's cleaned and derusted I cast some boolits and drill a small hole (1/8" bit will work) in the sprue cut while it's in the mold. In a Dremel set is a mandrel for a felt buffer that attaches with a screw end. It will chuck in your variable speed drill or tapping handle. The threads on the mandrel will tap into the base of the boolit pilot hole. A little Maas or any other metal polishing crème applied to the boolit/cavity and spun SLOWLY will clean it up the last little bit. Toothpaste will also work but is a pain to get out of the cavities. Hah! Toothpaste-cavities. Go slow, clean and check often. Last edited by jsizemore; 03-18-2018 at 10:52 AM.